Tuition rising — anyone surprised? Today’s announcement of plans to raise tuition at Iowa universities should not surprise anyone. When the Legislature cuts back, the regents need to fill in the gaps. And that creates new gaps, in family budgets immediately, and beyond, with — student debt. The full picture is considerably more stark. 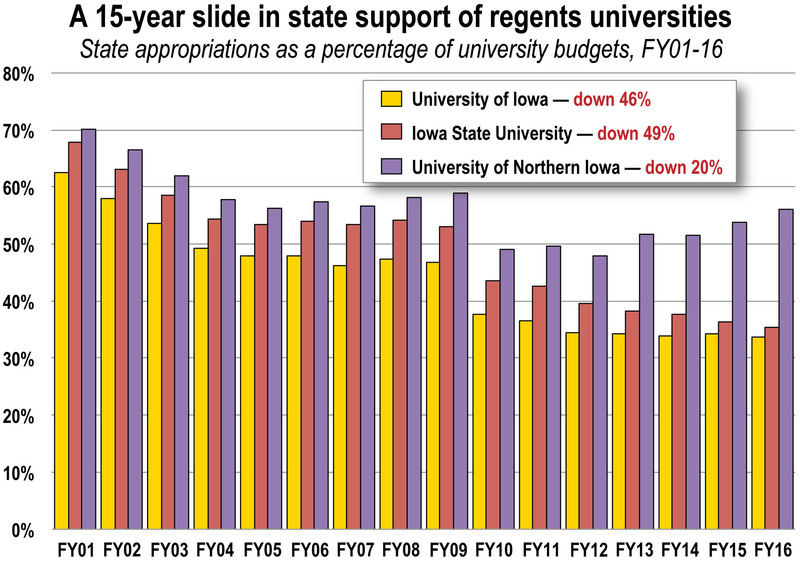 Adjusting for inflation, state funding for public universities has declined since fiscal year 2001, by 40 percent at the University of Iowa, 42 percent at Iowa State University, and 28 percent at the University of Northern Iowa. And these calculations do not include the recent current-year budget cuts for FY2018 ordered by the Legislature and signed by the Governor that took a disproportionate share from the regent institutions — $11 million or about one-third of the total. In fact, there has been a shift in the primary source of funding, from state appropriations to tuition and fees. In fiscal year 2001 the University of Iowa received 63 percent of its budget from the state. In fiscal year 2016 it had dropped to 34 percent. For the other universities the drop was: 68 percent to 35 percent at ISU, and 70 percent to 56 percent at UNI. How much harder has it become to pay for a college education in Iowa? In fiscal year 2001 individuals working at the median wage in Iowa could pay for the average tuition at the regent universities by working for 36 days. That number had increased to 60 days in fiscal year 2016 — a two-thirds increase. For low-income individuals, those working at the 20th percentile of wages, the challenge is even greater: days of work required increased from 53 to 92 — a 75 percent increase. There is a price to families when the Legislature chooses not to fund higher education. Adjusted for inflation using the Higher Education Price Index, 2016 dollars. Iowa Board of Regents data; adjusted for inflation using the Higher Education Price Index, 2016 dollars, tuition and fees rose by 72 percent from 2001-16 at ISU, 74 percent at UNI and 75 percent at UI. Iowa Board of Regents data. Author’s calculation of work days needed to pay tuition and fees is the NCES average tuition and fees (adjusted) divided by Economic Policy Institute analysis of Current Population survey data of Iowa median and 20th percentile wages, divided by 8 (hours). Brandon Borkovec is a Masters of Social Work student at St. Ambrose University, working this school year as an intern at the Iowa Policy Project on public policy analysis. One of the problems with backpedaling is if you don’t do it well, you trip. Somebody catch Senator Chuck Grassley. Ironically, while promoted as a pullout quote in the packaging of the story, the “booze or women or movies” comment came quite low in the piece. 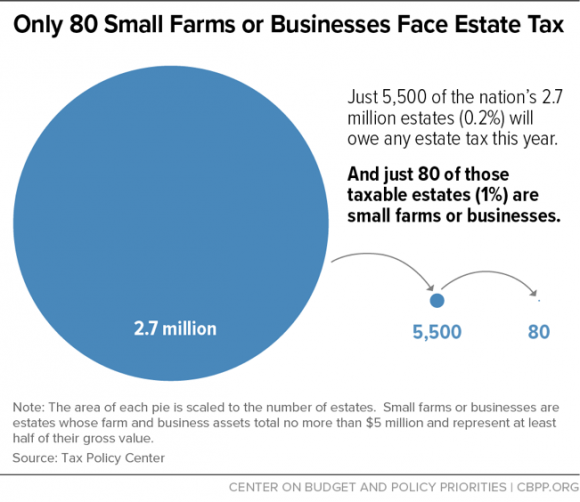 More substantive problems with the Senator’s rationale for opposing the estate tax were presented higher: specifically his continued insistence that this has something to do with the survival of family farms. Senator Grassley has promoted this unsupportable justification for his position for many years. This New York Times piece from 2001 includes it. And he renewed it again Monday in claiming his “booze or women or movies” comment was out of context, taking the opportunity to promote his spin again — and again getting wrong the facts behind his fundamental objection: the impact on farms. While only a handful might actually have to pay any tax at all because of the generous exemptions in the estate tax — shielding $11 million per couple’s estate from any tax — no one in the many years the Senator has pretended this is an issue has been able to cite a single farm that had to break up because of the tax. The tax legislation in Congress will cause millions to suffer, directly through a loss of health insurance, some with actual tax increases even at middle incomes, and over time with a loss of critical services that help low- and moderate-income families just to get by. Furthermore, any middle-income tax cuts expire in 2026 while high-income benefits and corporate breaks remain in effect. And then, even more will suffer. Is it a greater priority to absolve those beneficiaries of the need to contribute to public services — and make everyone else in the United States borrow billions more from overseas to pay for it — or to establish reasonable rules once and for all to assure the very wealthiest in the nation pay taxes? Do we pass on millions tax-free to the heirs of American aristocracy, or do we pass on billions or trillions of debt to America’s teen-agers? We all shall inherit the public policy now in Congress. As long as the estate tax exists, it remains the last bastion assuring that at least a small share of otherwise untaxed wealth for the rich contributes to the common good, or at least toward paying the debt they leave us. Fear not for their survivors; they still will prosper handsomely. 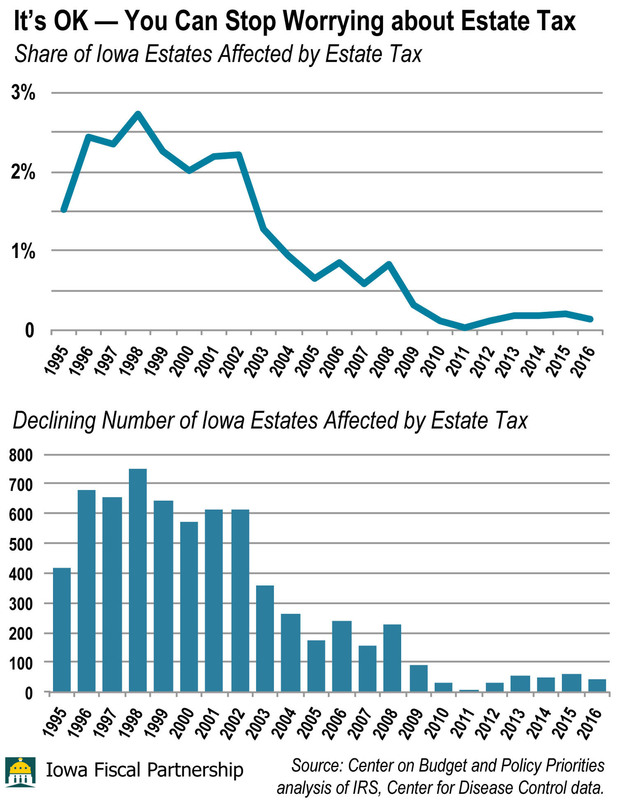 Editor’s Note: This post was updated Dec. 6 with the graphs showing the decline in Iowa estates affected by the estate tax. Why not a special session? Might not our state lawmakers want to weigh in? If anything has been clear about the current health-care debate in Washington, it is that little is clear — except the likelihood that (1) people will lose insurance coverage and thus access to health care, and (2) this will pose new challenges for state government. 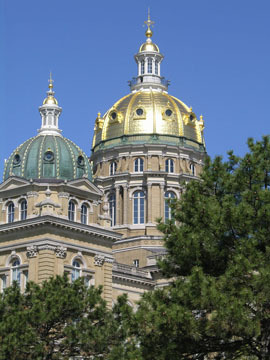 That being the case, it seems a good time for the Legislature to return to Des Moines and sort it out, sooner rather than later. It will be easier for legislators to talk to their federal counterparts about all this before legislation passes than afterward. Because of the Affordable Care Act (Obamacare), the Medicaid expansion serves about 150,000 Iowans, and would serve an estimated 177,000 Iowans in 2019 if preserved. But those Iowans — and some 55,000 more — would be in jeopardy of losing insurance under legislation pending in the Senate. If the enhanced federal share of funding for Medicaid expansion is reduced or eliminated under any legislation to come — and both the House and Senate bills currently would do this — states would have a choice: Fill in the gap or let people go uninsured. Oh, and if you’re going to choose to fill in the gap, go ahead and plan now on what will have to be cut to compensate for it. K-12 education, perhaps? Even more cuts to the regents institutions? Child care? Water protection? Law enforcement and corrections? Already, legislators and Governor Kim Reynolds are facing those kinds of questions amid a looming fiscal shortfall and speculation about a possible special session. Now is also the time to be speaking frankly about the longer-term impacts of health care policy — and for that reason, waiting until fall might be too late. Legislative leaders and the Governor right now could be bringing in experts for a special session to discuss the potential impacts, and reach out to the congressional delegation, before decisions are made that restrict state budget choices for many years to come. Unless, of course, they want to see budget crunches and special sessions more frequently. Iceberg ahead — but how big? The Des Moines Register disclosed Wednesday afternoon in a copyright story that the private, for-profit companies now running Iowa’s Medicaid program are finding big problems in the first year. With big policy decisions ahead on the future of Medicaid, not only in Iowa but in Washington with a new administration, it is reasonable to wonder if Governor Terry Branstad’s go-it-alone Medicaid privatization is only the tip of the iceberg — and how big the iceberg may be. Besides the great uncertainty for health-insurance coverage for millions if Congress repeals the Affordable Care Act (ACA) without a replacement, there is the idea that Congress might block-grant Medicaid. The goal would be to save the federal government money — not to assure health care for the most vulnerable as Medicaid now provides. Such a block grant would push states to cut their Medicaid programs deeply. To compensate for the federal Medicaid funding cuts a block grant would institute, states would either have to contribute much more of their own funding or, as is far more likely, use the greater flexibility the block grant would give them to make draconian cuts to eligibility, benefits, and provider payments. Maybe someone can provide the campaign literature from the 2016 legislative races that illustrates successful candidates’ thoughts on whose coverage would be the first to go. Who gets cut off? Someone will have to decide that if we go to a block-grant program. It probably won’t be Governor Branstad making that tough decision, by the way. The new ambassador-to-be will be off doing diplomatic stuff in China when these hard decisions are made. Is that what these new legislators signed up to do when they put their names on the ballot? But they could check in with Senator Grassley and Senator Ernst to find out if Iowa Statehouse job descriptions might change in the months ahead. It seems no Governor Branstad costume is complete without rose-colored glasses, even after Halloween. For on the final day of October, as goblins prepared to venture out to neighbors’ houses for treats, the Governor offered news on his unilateral decision to privatize Medicaid: It will cost the state an extra $33 million this fiscal year, payments to private companies not previously anticipated. But the situation will not negatively impact the state budget because Medicaid cost savings will exceed $140 million when compared to the old Medicaid program, they said. Hmmm. So, we’re going to spend $33 million more — $33 million we weren’t planning to spend — and that doesn’t “negatively impact” the state budget? That is not what we’re told when it’s $33 million for schools, or cracking down on polluters or businesses that deliberately stiff their employees for wages owed. For those things, we just don’t have the money. Think of it this way: Last month, the Revenue Estimating Conference projected that the state would take in $72 million less in FY2017 than it had estimated in March. That means those funds will not be coming in and may affect what can be spent. Now, we learn of an extra $33 million charge. Already, some $100 million less for the current year. Of course the $33 million matters. There is an impact on the budget bottom line, and it is disingenuous to suggest otherwise. Budget projections are always a difficult thing. But from the start of the Governor’s decision to privatize Medicaid, without legislative consent, we have been asked to accept optimistic assessments of what to expect. And if the optimism is misplaced? Education funding and other general-fund priorities inevitably lose. Medicaid privatization already has scared a fair number of Iowans about their access to health care. Those fears are not resolved. Neither are concerns about the fiscal side of this issue. We all know the drill: The Legislature passes bills and the Governor signs or vetoes them, whereupon they become either laws, or nothing. The move by the Branstad administration to implement a new sales tax break worth an estimated $40 million a year — possibly more — is taking place outside the legislative session. If it succeeds, we have entered a new world of executive authority in Iowa. Part of the change affects Iowa’s existing sales and use tax exemption for machinery and equipment used in the manufacturing process. The change is sound policy. It’s easy to look at political discourse today and conclude everything is a battle between Democrats and Republicans, the left and the right, liberals and conservatives. But far more is going on with this issue. … A Democrat will surely be Governor again someday, and it would be a mistake to set a precedent that allows the Executive Branch to so drastically change the tax climate. If Republicans in the Legislature do not stand up against this unprecedented over-reach of power, they will almost certainly live to regret it. The balance of political power changes from one election to the next. The balance of constitutional power — the relationship between the Iowa General Assembly and executive departments of government — is more serious and more lasting. Broad interpretive powers given up by the Legislature, in one moment of time, concerning one issue, are not easily, later recovered. 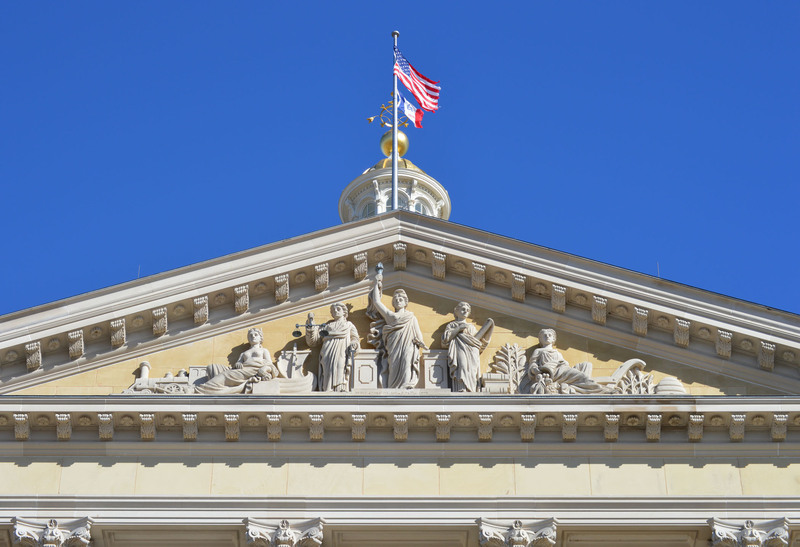 The Branstad administration should drop its rule change bid and make its case to the General Assembly, which is elected to craft a budget and write tax policy. If it’s truly a great idea that will create jobs, as the department contends, surely the sales job won’t be that difficult. Many businesses, we often note at IPP and the Iowa Fiscal Partnership, already pay no income tax in Iowa, and they just had their property taxes slashed. The corporate appetite for tax cuts is insatiable. Guess who pays? * Note: The Department of Revenue estimate of the cost of this tax break to both the state and local governments is over $40 million for each of the first four full years of implementation, according to a document provided the Administrative Rules Review Committee. The Legislative Services Agency has told ARRC that it does not have enough information to determine the accuracy of that estimate. We have revised the initial version of this blog post to reflect this uncertainty, until state officials agree on an estimate. It’s really quite amazing what kind of arguments people will use to beat up poor people. Such an example is in the comments section of a story in today’s Des Moines Register about the debate over the Supplemental Nutrition Assistance Program, or SNAP, commonly known as Food Stamps. One writer, in playing to SNAP opponents, is pushing the idea that two full-time jobs at minimum wage lift a family above poverty according to the current administration. In that case, the writer implies, food assistance isn’t needed. Let’s take a look at the actual numbers and what they mean. It’s not heavy lifting. Actually the federal poverty guidelines as established have been consistent — and consistently faulty — through several administrations. They are seriously outdated and underestimate what is necessary to make ends meet. The official poverty level for a family of four in 2013 is $23,550. Does anyone seriously believe a family of four can make it on that kind of income? Rent, food, clothing, utilities — the basics of just getting by — cost more than that in real life. The Iowa Policy Project has looked at this issue and is constantly updating a more reliable estimate of what it costs to get by — our report, “The Cost of Living in Iowa,” is available on our website with county-by-county numbers that reflect this cost for varying family sizes. You can quickly see how two minimum-wage jobs don’t get the job done. 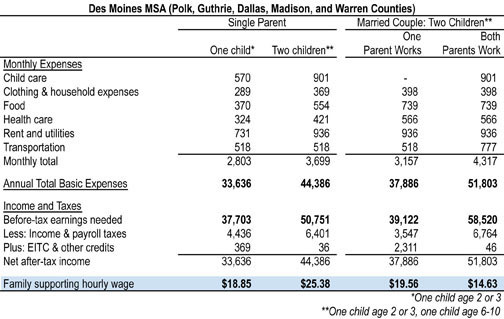 A bare-bones family budget for a four-person family in the Des Moines area is — conservatively — $37,886 for one working parent. (Table below). That assumes $3,157 per month for clothing, household expenses, food, health care, rent and utilities, and transportation. If a second parent works you add more transportation costs, plus child care, which becomes the second-largest expense. Next, figure in taxes — yes, they pay taxes, and a lot as a share of their income — and you get what it takes for a family just to get by. So, this absolutely no-frills budget, with no savings for school or a home or retirement, not even burgers at McDonald’s, rings up at $39,122 before taxes for one working parent, $58,520 for two. And that means jobs that pay $14.63 an hour for each working parent, or $19.56 if one works. Yet, at the $7.25 minimum wage, two jobs would pay $30,160. So much for the argument that two minimum-wage jobs per family solve poverty. This helps to show why the meager Food Stamp benefit of about $1.25 per person per meal is such an important support for Iowa’s low-income working families. But while we’re at it, we could start talking about a higher minimum wage. Another day, perhaps. Hard for anyone to argue with that. Advocates of preschool surely would not fear a legitimate review. And what better time to review and adjust a program than its early years? Now, wouldn’t it be interesting to see the same concept applied to Iowa’s many tax breaks for corporations? Do they do any good? There is no evidence that they do for the most part, a fact ignored routinely by the Iowa General Assembly and our Governors past and present, but they just keep on going. The idea of a review of tax breaks only gets lip service from most lawmakers; there are no serious reviews and no teeth in state law to require them. The Research Activities Credit alone is a program crying out for this kind of scrutiny, a point clear from the few details that are available (See http://www.iowafiscal.org/2012research/120221-IFP-RAC.html). Unlike the preschool program, in which 9 out of 10 Iowa school districts participate, the RAC is used by a relative handful of companies in Iowa, well under 200, and is dominated by less than 10. The money is not all that different: $58 million in 2011-12 for preschool through the state formula vs. almost $48 million for the RAC in 2011 — with $45 million of that paid in “refund checks.” These are not refunds of taxes paid, and they don’t even reduce taxes. Instead, millions go to big corporations such as Rockwell Collins, Deere and DuPont that owe so little in income tax that their tax credits are far above the amount of taxes they owe. What’s good for the goose of preschool is certainly good for the gander of tax breaks.